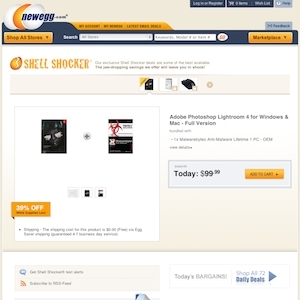 The Newegg Shell Shocker showcases Newegg's top deals which run at intervals throughout the day. I guess it's similar to how Amazon's lightning deals run or almost how Woot-Offs go off over at Tech.Woot. Either way, these deals are sure to amaze... No wonder they refer to them as shell shocker deals. Newegg.com currently ranks #7 amongst sites offering online deals -- Home Depot ranks #6. In the Computers and Electronics category, Newegg Shell Shocker ranks at #1. Offers daily deals on electronics.